Some specific theorems on solid geometry are discussed here under this section. Proposition 1: One and only one plane can be drawn through any two intersecting straight lines. Proposition 2: Two intersecting planes cut one another in a straight line and in no other point outside the line of intersection. The above two propositions lead to the following conclusions. (a) A straight line intersects a plane at one point only or lies wholly in the plane or is parallel to the plane. (b) Infinite number of planes can be drawn through a given straight line. (c) The straight line joining two given points on a plane lies wholly in the plane if it be produced indefinitely in either direction. Example: Show that two parallel lines and any of its transversal lie in the same plane. 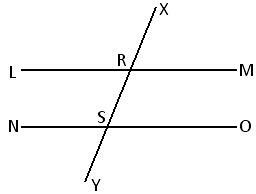 Let LM and NO be two parallel lines and XY, a transversal intersects LM at R and NO at S. We are to prove that the lines LM, NO and XY lie in the same plane (i.e., they are co-planar). Proof: Since two parallel straight lines are co-planar, let us assume that the parallel tines LM and NO lie in the plane g. Now, the point R lies on the line LM and the point S on the line NO. Hence, it is evident that both the points R and S lie in the plane g. Therefore, the straight line joining the points R and S (i.e. the straight line XY) lies in the plane g.
Therefore, the straight lines LM, NO and XY lie in the same plane g.